The basic bank account-based methods are credit transfers, cheques (US checks), direct debits and card payments. 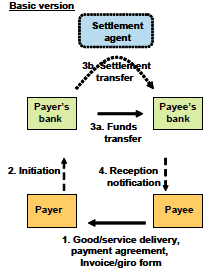 These are all variations of the same basic payment process by which funds are transported from the payer's (i.e., the buyer) account to the payee's (i.e., the seller) account. Credit transfers are used because it is easier, when both customers have a payment account, just to ask the bank to move the funds from one account to another rather than for the payer to withdraw cash that is then later deposited by the payee. Credit transfers do not need physical transportation of funds. The basic credit transfer process consists of a fund transfer from the payer's account to the payee's account, including the settlement transfer between banks. It is a credit push process, as the funds are "pushed" from the payer's bank to the payee's bank, which are the active partners in the process. Banks have created general international conventions for international credit transfers. These are most often exchanged via correspondent banking relationships based technically on SWIFT credit transfer processing messages. Direct debits are mainly used for recurrent payments to large creditors such as public utilities, insurance companies and newspapers. Direct debits have developed for national use and there are not yet any international standards. Due to the national nature of developments, existing direct debit processes vary considerably in their design. The legal basis also varies. Direct debits rely on a mandate given by the payer to the payee giving the latter the right to debit the payer's account. The payee sends the direct debit initiation transaction to his bank, which will forward it to the payer's bank for debiting. The payee is generally requested to inform the payer some days in advance about a direct debit by sending a separate notification or invoice. A mandate is an essential part of the direct debit process. In cases of fraud the banks can request the payee to provide the original mandate. An improved version of the creditor-based mandate process is the use of electronic mandates with electronic signatures that are enclosed with each direct debit transaction, or sent via a separate e-mandate process to the payer's bank. This is a secure way for the payer's bank to ensure that the payer has provided the payee with the necessary mandate. Card payments.Cards can be seen as permanent reusable cheques with electronic interfaces. Cards introduce improved features for secure customer identification. Efficient self-service interfaces for vending machines have also been developed for cards. However, card payments are still prone to fraud, and payers therefore have considerable room to reject payments made with their cards. They therefore need to check their account statements thoroughly for fraudulent payments. 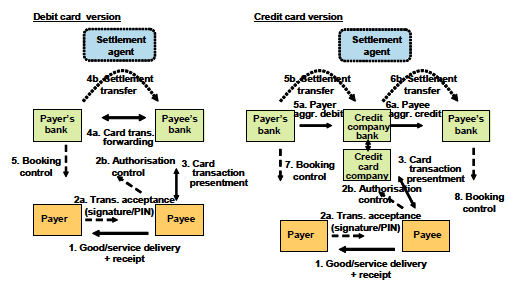 Within card payments, two quite distinctive account structures and service types have developed: debit cards and credit cards. With debit cards, payers' bank accounts are debited directly and merchants' bank accounts are credited directly. With credit cards, a special credit card company usually issues the cards and provides credit to payers.